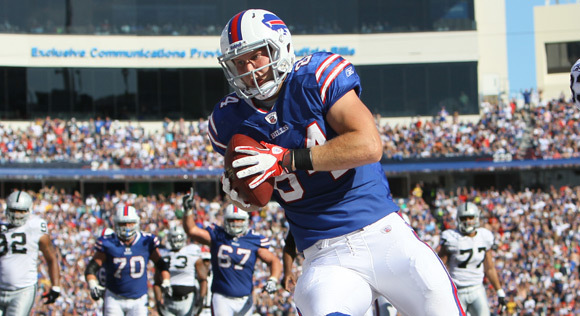 Scott Chandler spent the 2011 season playing tight end for the Buffalo Bills. Despite the rough season the Bills endured, finishing 6-10, Chandler got his first opportunity to start this season and showed the Bills, and fans alike, what he’s capable of. I recently got a chance to speak with Chandler. We discussed the Bills’ season, concussions in the NFL, and whether he’d take Jeremy Lin or Tim Tebow to win a game. 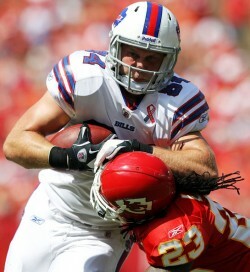 TSH: The Bills were 4-12 in 2010. What were your expectations coming into this season for this team and yourself in particular? SC: I think that any time you go into an NFL season your goal has to be to make the playoffs. I mean, the Dolphins a couple of years ago went from 1-15 to winning their division. The Detroit Lions are a couple of seasons removed from 0-16, so you’ve got the ability to turn it around in one year, and I think that was our goal: to make the playoffs and to win our division. TSH: During this season your coach Chan Gailey said that you’d turned out to be even better than he’d thought. Was it just a matter of getting the opportunity to play or was it the offense and the system that the Bills were running? SC: I think a lot of it is the opportunity. I like our offense, I like our system and everything, but this was my fifth year in the league and the first chance I really got to play a lot on offense, so I think the opportunity was the biggest thing for me. 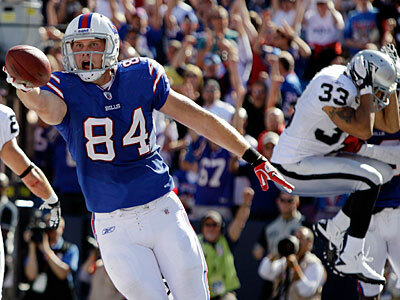 TSH: The Bills got off to a hot start, 5-2, including two huge home wins against the Raiders and the Patriots. However, as things started hitting a rough spot during the middle of the year–losing seven straight games–people started to step back on their praise for your QB Ryan Fitzpatrick. What did you see from Ryan throughout the season and do you think he’s the right guy for the job in Buffalo? SC: I think Ryan’s really good. I think what really hurt us is we ended up having a revolving door at the second receiver spot. We had Steve Johnson, who was kind of nicked up all year, but he was still pretty consistent for us, and then Fred Jackson went down and we started to rely a bit more on the passing game. But that second receiver wasn’t consistently the same guy. We were just having guys get hurt, so Ryan was throwing to people on Sunday that he didn’t practice with at all during the week, and I think that’s pretty hard to do in the NFL. He took a lot of the heat for it, but I think it was just a team effort, and then we had that losing streak, too. TSH: What’s the most important thing you think you guys took away from this season, given how it started and how it ended? SC: We thought we had the ability going in to win, but I think we know now that, yeah, we can win at this game in this league. There’s going to be injuries and you’ve got to persevere along the way, and we’ve got to manage that better than we did this year. You can’t get off to a 5-2 start and then just think that you’re going to continue to win just because you show up. Every week in the NFL is going to be a battle and you’ve got to go out there—whether you’ve got all your guys or not—you’ve got to go out there with the right attitude and the right preparation. TSH: So, would you say you guys are entering this season on somewhat of a high note, knowing now that you can play with these competitive teams, like the Patriots? SC: I wouldn’t say it was going out on a high note. I’ve kind of got a bad taste in my mouth. We knew early on we could play these games; it was just a matter of doing it. I don’t think we’re downtrodden or upset about that. I just think we need to get back to work so we can get better. TSH: Is shoring up that number two receiver spot the biggest thing the team has to improve on this offseason? SC: I think we could use another receiver, but we need to help our pass rush out a little bit, too. TSH: What can you say to Bills’ fans out there about what they can look forward to come 2012? SC: Well I’m a free agent now, but I just think that they need to understand that their team is going in the right direction. I think that the coach and the quarterback are in the right spot, and I think a lot of fans question that, but I definitely think those are the right guys for the job. Basically, stick with your team through the lows, but they’re NFL fans, you know? They understand what goes on and you know they want a good product on the field, and I don’t blame them for that. TSH: You said you were a free agent. Would you like to see yourself back in Buffalo? SC: That’d be great. I’d love to be back in Buffalo. But this is where the game turns into a business. I’ve been on the bad end of the business four times—I’ve been cut four times—and you want to make the most out of the opportunities, and you don’t get that many opportunities. You’ve to maximize your value in the league. TSH: Troy Aikman recently came out saying he’s worried about the long-term viability of the game citing concussions as a major reason. Do you feel the NFL is doing enough to address the concussion problem or do you think there needs to be more awareness or better protocol? SC: I think the awareness is getting to a pretty good level now. You’re just seeing these guys and the impact that these concussions had on them when they were playing in the 70s and 80s. I think as a player today, it’s hard to see that because you don’t have those effects right now. But I think that the awareness has really been raised and you take a bit more caution when you get a concussion now. Concussions are really hard to diagnose, though, and I think whether you get a concussion or not, the blows to the head now probably just end up piling up. You’ve got to be smart about the equipment that you’re wearing, and if you have these effects, take care of yourself because there’s a lot more to life than football and making money. You’ve got to just be careful. TSH: What do you think about some players’ opinion that they shouldn’t tell a doctor or a coach if they think a teammate has a concussion? Do you think it’s a good thing to have players policing each other? SC: I think that there’s a point where you have to help a teammate out. If he doesn’t know where he is on the field, you shouldn’t even want the guy out there. But these guys have a lot of pride and they want to play and their job is never very secure in the NFL. It’s hard to get the ‘club in the tub’, as they say. These guys want to be out there, but I think there’s a point where if you feel like one of your teammates is putting himself in danger, you help him out. But if a guy says he’s good to go and he seems coherent, I’m going to let him go. TSH: Thoughts on Jeremy Lin and Lin-sanity? SC: I think it’s great. For the NBA it’s definitely great because it’s a lot more attention for them. I mean the kid can obviously play. He was able to beat the Mavericks, so he’s got to be pretty good to do that. TSH: There are a lot of comparisons going on between Lin and Tim Tebow. Who would you put more faith in: Jeremy Lin to hit a game-winning shot or Tim Tebow to lead a game-winning drive. SC: Well, I think Lin’s one-for-one in game-winning shots right now, so he’s a 100 percent. It’s probably pretty close, but I’ll go with Jeremy Lin right now. TSH: Last one for our site: We combine sports and comics and superheroes, so we’re asking all the athletes, if you could be one superhero, who would it be and why? SC: Superman. Hands down, man. He’s just got it all. He’s got the looks and he can fly, and flying’s pretty cool to me. Now a free agent, Chandler is sure to garner interest from teams around the league this offseason. If the Bills can learn anything from their AFC East rivals, the New England Patriots, it’s that having two dominant receivers can get you a long way. Lining Chandler up alongside fellow receiver, David Nelson, would give the Bills the makings of a dominant tandem on offense that could help carry this team to the next the level in the years to come.